Because next week is Super Bowl Week, and we'll all be mercifully distracted by the prospect of an actual NFL game, this will presumably be the last time we can talk about the Jets for a couple of weeks. One suspects the Jets would have it no other way. 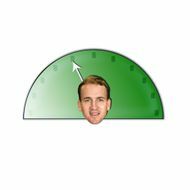 So we better take one last look at the Manning-to-Jets-o-meter before storing it away until the Super Bowl is over. Thus: News! Pro Manning-to-Jets: Darrell Revis gave a wide-ranging interview in which he pretty much admits all the discord and in-fighting among the Jets was specifically about Sanchez. (Also, disturbingly, he says Rex Ryan didn't know anything about it.) The more and more Sanchez is singled out as the source of the problems, the closer the Jets come to realizing that they must do something drastic to change the whole vibe of negativity around the team. Maybe? Pro Manning-to-Jets: Manning is gonna have to go somewhere, because he ain't staying in Indianapolis. Dan Wetzel of Yahoo! Sports does a great job running down precisely why, but basically, it comes down to Rob Lowe. Like everything does. Anti-Manning-to-Jets: There will be several other teams involved, and some longtime observers don't even think the Jets are in the top five. (The top five: Arizona — ! — Kansas City, Seattle, Miami, and Washington.) This discord business doesn't make the Jets look particularly attractive. Anti-Manning-to-Jets: The Jets are treating the very notion like it's fan fiction. Here's Nick Mangold on the idea: "You can say that about ... What if Tom Brady came out? What if Dan Marino in his prime came out? I think everybody would want them. But Mark's my guy. He's the guy I'm going to battle with." Wait ... Mangold knows Manning is a real person, right? Anyway, there's your update. The Manning-to-Jets-o-meter, in truth, should probably be at about two or three, but we're bad at Photoshop and didn't have the time to move the meter down a notch. Go Giants!